A Robot Save move set is a sequence of locations that tape volume movement should follow. 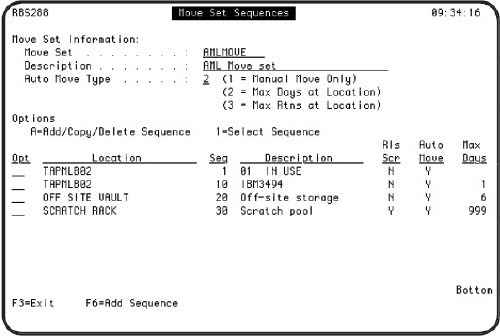 The move set documents a tape’s movement cycle from backup to storage and to backup again. Each list of locations (the move set sequence) is given a move set name. You can create as many move sets as you want. Each backup set can have its own move set, or can reference a common move set. See the Robot Save User Guide for a complete discussion of creating and using move sets. Manual: Volume movement occurs only if you select the option to move a rotation or individual volumes. Robot Save does not automatically move the volumes. Maximum Days at Location: Robot Save automatically moves backup set rotations from one location to the next based on the number of calendar days allowed at each location. Volumes move automatically to the IN USE location when they are used in a backup. When the backup completes, the volumes in the rotation move to the next location in the move set. The volumes remain at each location for the specified number of days, then move to the next location the next time a save is run. You specify the number of days (including weekends) that the rotation remains at each location. A rotation becomes eligible to be moved after it has been at the location the specified number of days. Maximum Rotations at Location: Robot Save automatically moves backup set rotations from one location to the next based on the number of rotations of a backup set allowed at each location. Volumes move automatically to the IN USE location when they are used in a backup. When the backup completes, the volumes move to the next location in the move set. The volumes remain at the location until the total number of rotations of the backup set at the location has been exceeded, then move to the next location. Note: If you use a scratch pool location, volumes should not move to the scratch pool location until they expire. The sum of the maximum number of days in each location (except the scratch pool location) should be equal to or greater than the actual number of days before the media expires. When a backup completes normally, the RBSAUTOMOV command runs automatically if an automatic move set is attached. This moves all volumes that are to be moved for that day. If you do not run daily backups or run backups that do not have automatic move sets, you can schedule the RBSAUTOMOV command to move volumes to the next location automatically. We recommend that you schedule the RBSAUTOMOV command to run daily in case your backups fail. If any days are missed and the command is not run, the next backup with a move set performs a "catchup" move and moves the volumes to where they should be. You also can run the RBSAUTOMOV command to perform the catch up move. If a volume is moved to the scratch location after it has expired, the volume is removed from the rotation and released to the scratch pool automatically. The following examples show how you can define and use move sets with an AML. The backup set performs daily backups with eight rotations, one day until the next rotation, and seven days before the media expires. The AML definition has Delay tape ejections set to 0. Volumes used in a backup remain in the AML and are ejected manually after each backup. The move set is defined as Type 2, Maximum Days at Location. Note: The first two locations in the move set keep the volume in the AML. If you use alternate sets, the move set should be defined only to the primary backup set, not the secondary sets. Volumes used with alternate sets always are assigned to the rotations of the primary backup set. Note: Specifying the location as *NEXT allows auto movement of volumes to continue; entering a specific location name stops auto movement. The Weekly backup set is defined with three rotations, seven days until the next rotation, and 14 days before the media expires. The AML definition has Delay tape ejections set to 2. Volumes used in each backup are placed in a queue to be ejected after all backup jobs have completed. The volumes are ejected using the Process Queued Ejections (RBSEJQVOL) command. You also can eject the volumes from the AML by selecting option 6, AML Queued Ejections, on the Automated Media Library Maintenance panel. The move set is defined as Type 2, Maximum Days at Location. If the next location in the move set sequence after the IN USE location is the AML location, Robot SAVE cannot queue the volumes and the volumes are not ejected when the RBSEJQVOL command runs. The volumes remain in the AML inventory and in the AML location until the move set moves them to the next location in the sequence. If you are using alternate sets, the second location in the move set must be the AML location so that the volumes remain available for the next backup set. You can find additional information on creating and using move sets in the Robot SAVE User Guide. Also, see "Robot Save AML Support: StorageTek Automated Media Libraries. and "Robot Save AML Support: IBM Automated Media Libraries." Occasionally, you might need to move volumes manually from one location to another. Do the following to move a rotation of volumes to a new location. Select option 2, Save Media Management. On the Save Media Management Menu, select option 1, By Backup Set Rotations. On the Backup Class Selection panel, enter a 1 next to the backup class name. On the Rotation Maintenance panel, locate the backup set that used the rotation to be moved and select it with by entering a 1 in the Opt column. When the Media Volume Maintenance panel displays, press F7 to move the volumes. The Move Options window displays so you can select where you want to move the volumes. Note: You should move volumes manually only on rotations that use manual move sets or with no move sets.